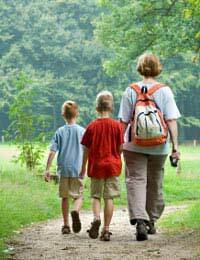 Hiking with children can be great fun, but it's important to take necessary precautions. While they will experience nature first-hand in an unparalleled setting, they can also experience sunburn, dehydration, and getting lost, as well as various injuries ranging from a sprained ankle to a broken limb. Make your first hikes enjoyable by playing it safe! Your children don't have to have the stamina of an elephant or the agility of a mountain goat to go on a hike. Children aged two to four are capable of hiking anywhere from half a mile to two miles, sometimes more, with frequent rest stops. Children aged four to seven can hike for up to three hours a day over easy terrain. And kids aged eight and nine should be able to accomplish a full day's hike. The key to a good hike is to prepare in advance. That means not only telling your children about what they are doing and what they will see, but also bringing the right kit. For most people, that will include a map of the area, plenty to drink suncream, sunglasses, mosquito repellent, snacks for the road, a hearty lunch, wipes, and the right footwear and clothing. Children should be taught that hiking is a privilege, not a right, and that they shouldn't take it for granted. They should respect the trails and obey all rules. That will not only stop them from straying far and getting lost, but will also protect delicate flora and fauna from human damage. Kids should also realise that they should leave nature as they found it – without any rubbish. They should admire plants and animals with their eyes, not their hands, and understand that cleaning up after themselves is vital. It's easier to keep track of children on short hikes, but if you are camping or going on a day hike there are more safety issues to consider. You may want to pack your child's backpack with a whistle, water bottle, warm sweater and snacks – just in case they stray. Also, be aware of lakes, streams etc that could pose a safety hazard for young children. Don't let them out of your sight even for a moment, but take special care if water is nearby. The same goes for any dangerous drop-offs, precipices or cliffs. Teach your child to stay on the trail, never let them hike alone, and pick out a prominent hill or landmark to prevent them from getting disoriented. If a child does get lost, get help immediately. Always plan in advance. It's important to know where you're going and how to get there. If you are hiking along a well-known trail great, if not, try to find a map of the area before you set out. Learn proper first aid skills. If you are hiking far from available medical attention, it's important to know first aid. And even if you hike for an hour or two, make sure you always carry a first aid kit. Look before you leap. It may sound obvious, but simple injuries occur when people get carried away and trip over a tree branch or rock. Kids in particular should pay attention to the trail. Don't hike alone. Don't even let your teen hike by themselves – accidents can happen! Carry the right provisions. Food and enough water are important, and young kids get dehydrated easily. Make sure you have plenty to drink on hand. Suncream is also a must. Take breaks often. Getting tired isn't a good idea on the top of a hill – or anywhere. Pace yourself and make sure your energy doesn't run out. Hiking is fantastic family activity that doesn't cost the earth – and allows you to see the earth in the way nature intended. Teach your children basic safety tips and instill in them a love of what the world has to offer. Most importantly, have a good time!